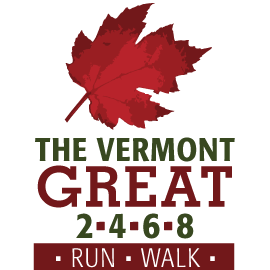 Please join us on Saturday, September 15th for the 2nd annual Vermont Great 2,4,6,8K Run, Walk in beautiful Downtown Rutland. The race will start and finish on Center Street, and participants will enjoy a wide variety of activities and food options after the race. For one day only, take advantage of the Green Street Challenge with green grass on Center Street creating a natural play space for children and families. Visit the unique shops and restaurants along Center Street, check out the Farmer’s Market, and enjoy the Shriner’s Parade. The first 100 participants will get a race t-shirt! Day of Registration will be open on Center Street from 8:30 to 10. Day of Registration fee will be $30 per person. All routes will start and end on Center Street. Please check back closer to the event for updated route maps.